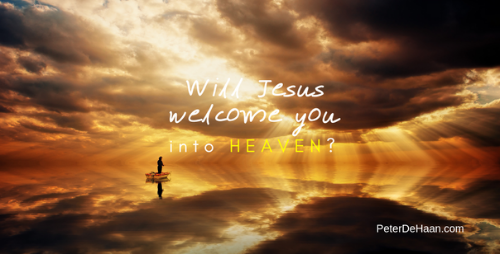 Jesus Stands to Welcome Stephen into Heaven: Is Jesus Waiting for You? Is Jesus Waiting for You? HomeBlogThe BibleIs Jesus Waiting for You? cponhe Sanhedrin. His sermon smartly recaps the story arc of the Old Testament, starting with father Abraham and spilling over into the New Testament, ending with a sacrificial death of Jesus. Though I would never suggest someone skip reading the Old Testament, if you want a quick understanding of its essential elements, study this passage. Though Stephen’s historical recitation is accurate, it offends the Jewish leaders. They plug their ears, scream loudly, and rush toward Stephen. They drag him outside the city and begin throwing rocks at him. Stephen’s getting stoned. As he dies, he prays. First he asks Jesus to get ready for him. Then he prays for the people pelting him with rocks, that they’ll receive forgiveness for their murderous act. Then Stephen dies. But there’s one part of the story I left out—an important part. Between Stephen ending his overview of the Old Testament and his hearers becoming so incensed with his words, he looks up into heaven and tells the people what he sees. He sees God in all his glory, with Jesus at his side. But Jesus isn’t sitting next to Father God, as the Bible usually describes. This time Jesus stands. It’s as though he has stood up, ready to welcome Stephen into heaven. Even before Stephen prays for Jesus to get ready to receive his spirit when his body dies, Jesus is prepared. He rises, ready to welcome his faithful servant into eternal glory. Though the Bible doesn’t mention it, I imagine Jesus with outstretched arms, a broad smile, and mouthing the words, “Welcome home, good and faithful servant.” When our time comes to join Jesus in heaven, may we receive the same welcome.